Closed panel timber frame manufactured in our factory and lifted into place using crane. Windows and door were pre-installed in this particular project. Both external and internal walls are manufactured to a closed panel system including insulation and Fermacell Board to either side of the walls. Our closed panels are manufactured in our own manufacturing facility. Openings for doors and windows are incorporated in the fabrication with the doors and windows themselves fitted on site (to prevent damage whilst in transit). With our full build package we can offer a price for supplying and fitting the external windows and doors. Conduits and back boxes can be supplied alongside the closed panels which can be easily fitted within the panels convenient service void, making it easier for plumbers and electricians to carry out their first fixes. This design feature saves on costly labour time on site, reduces the amount of waste to be removed from site and enables a house to be made weather tight quickly. All our packages can be tailored to suit your requirements. We are happy to assist in the design of the package in order to meet your requirements, budget and the ‘U’ value you wish to achieve. The options below are a sample of the different variations on offer with our closed panel system. The panel designs fit with various external finishes and depending on specification, can be tailored to suit your requirements, budget and U Value you wish to achieve. 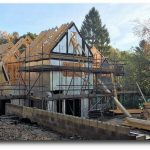 With the addition of extra insulation, the panels can further address cold bridging, ensuring your structure is conserving energy and saving on heating costs. The Fermacell Board we use on the internal face of the panels is not only a strong load-carrying board, meaning it can take up to 50kg per cavity fixing, but it is also moisture resistant and has 60 minute fire resistance. The board is fitted to the panels within our factory and requires hire of a crane for lifting. If there are access restrictions that will not permit the use of a crane, the boards can be installed on site. We supply all plant and materials using our professional teams working to current Health & Safety Regulations.